The native form of this personal name is Szilárd Leó. This article uses Western name order when mentioning individuals. Leo Szilard (/ˈsɪlɑːrd/; Hungarian: Szilárd Leó [ˈsilaːrd ˈlɛoː]; born Leó Spitz; February 11, 1898 – May 30, 1964) was a Hungarian-German-American physicist and inventor. He conceived the nuclear chain reaction in 1933, patented the idea of a nuclear reactor with Enrico Fermi in 1934, and in late 1939 wrote the letter for Albert Einstein's signature that resulted in the Manhattan Project that built the atomic bomb. Szilard initially attended Palatine Joseph Technical University in Budapest, but his engineering studies were interrupted by service in the Austro-Hungarian Army during World War I. He left Hungary for Germany in 1919, enrolling at Technische Hochschule (Institute of Technology) in Berlin-Charlottenburg, but became bored with engineering and transferred to Friedrich Wilhelm University, where he studied physics. He wrote his doctoral thesis on Maxwell's demon, a long-standing puzzle in the philosophy of thermal and statistical physics. Szilard was the first to recognize the connection between thermodynamics and information theory. In addition to the nuclear reactor, Szilard submitted patent applications for a linear accelerator in 1928, and a cyclotron in 1929. He also conceived the idea of an electron microscope. Between 1926 and 1930, he worked with Einstein on the development of the Einstein refrigerator. After Adolf Hitler became chancellor of Germany in 1933, Szilard urged his family and friends to flee Europe while they still could. He moved to England, where he helped found the Academic Assistance Council, an organization dedicated to helping refugee scholars find new jobs. While in England he discovered a means of isotope separation known as the Szilard–Chalmers effect. Foreseeing another war in Europe, Szilard moved to the United States in 1938, where he worked with Enrico Fermi and Walter Zinn on means of creating a nuclear chain reaction. He was present when this was achieved on December 2, 1942. He worked for the Manhattan Project's Metallurgical Laboratory on aspects of nuclear reactor design. He drafted the Szilard petition advocating a demonstration of the atomic bomb, but the Interim Committee chose to use them against cities without warning. After the war, Szilard switched to biology. He invented the chemostat, discovered feedback inhibition, and was involved in the first cloning of a human cell. He publicly sounded the alarm against the possible development of salted thermonuclear bombs, a new kind of nuclear weapon that might annihilate mankind. Diagnosed with bladder cancer in 1960, he underwent a cobalt-60 treatment that he had designed. He helped found the Salk Institute for Biological Studies, where he became a resident fellow. Szilard founded Council for a Livable World in 1962 to deliver "the sweet voice of reason" about nuclear weapons to Congress, the White House, and the American public. He died in his sleep of a heart attack in 1964. According to György Marx he was one of The Martians. Born as Leó Spitz in Budapest, Kingdom of Hungary, on February 11, 1898. His middle-class Jewish parents, Louis Spitz, a civil engineer, and Tekla Vidor, raised Leó on the Városligeti Fasor in Pest. He had two younger siblings, a brother, Béla, born in 1900, and a sister, Rózsi (Rose), born in 1901. On October 4, 1900, the family changed its surname from the German "Spitz" to the Hungarian "Szilárd", a name that means "solid" in Hungarian. Despite having a religious background, Szilard became an agnostic. From 1908 to 1916 he attended Reáliskola high school in his home town. Showing an early interest in physics and a proficiency in mathematics, in 1916 he won the Eötvös Prize, a national prize for mathematics. With World War I raging in Europe, Szilard received notice on January 22, 1916, that he had been drafted into the 5th Fortress Regiment, but he was able to continue his studies. He enrolled as an engineering student at the Palatine Joseph Technical University, which he entered in September 1916. The following year he joined the Austro-Hungarian Army's 4th Mountain Artillery Regiment, but immediately was sent to Budapest as an officer candidate. He rejoined his regiment in May 1918 but in September, before being sent to the front, he fell ill with Spanish Influenza and was returned home for hospitalization. Later he was informed that his regiment had been nearly annihilated in battle, so the illness probably saved his life. He was discharged honorably in November 1918, after the Armistice. In January 1919, Szilard resumed his engineering studies, but Hungary was in a chaotic political situation with the rise of the Hungarian Soviet Republic under Béla Kun. 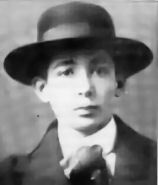 Szilard and his brother Béla founded their own political group, the Hungarian Association of Socialist Students, with a platform based on a scheme of Szilard's for taxation reform. He was convinced that socialism was the answer to Hungary's post-war problems, but not that of Kun's Hungarian Socialist Party, which had close ties to the Soviet Union. When Kun's government tottered, the brothers officially changed their religion from "Israelite" to "Calvinist", but when they attempted to re-enroll in what was now the Budapest University of Technology, they were prevented from doing so by nationalist students because they were Jews. Convinced that there was no future for him in Hungary, Szilard left for Berlin via Austria on December 25, 1919, and enrolled at the Technische Hochschule (Institute of Technology) in Berlin-Charlottenburg. He was soon joined by his brother Béla. Szilard became bored with engineering, and his attention turned to physics. This was not taught at the Technische Hochschule, so he transferred to Friedrich Wilhelm University, where he attended lectures given by Albert Einstein, Max Planck, Walter Nernst, James Franck and Max von Laue. He also met fellow Hungarian students Eugene Wigner, John von Neumann and Dennis Gabor. His doctoral dissertation on thermodynamics Über die thermodynamischen Schwankungserscheinungen (On The Manifestation of Thermodynamic Fluctuations), praised by Einstein, won top honors in 1922. It involved a long-standing puzzle in the philosophy of thermal and statistical physics known as Maxwell's demon, a thought experiment originated by the physicist James Clerk Maxwell. The problem was thought to be insoluble, but in tackling it Szilard recognized the connection between thermodynamics and information theory. Szilard was appointed as assistant to von Laue at the Institute for Theoretical Physics in 1924. In 1927 he finished his habilitation and became a Privatdozent (private lecturer) in physics. For his habilitation lecture, he produced a second paper on Maxwell's Demon, Über die Entropieverminderung in einem thermodynamischen System bei Eingriffen intelligenter Wesen (On the reduction of entropy in a thermodynamic system by the intervention of intelligent beings), that had actually been written soon after the first. This introduced the thought experiment now called the Szilard engine and became important in the history of attempts to understand Maxwell's demon. The paper is also the first equation of negative entropy and information. As such, it established Szilard as one of the founders of information theory, but he did not publish it until 1929, and did not pursue it further. Claude E. Shannon, who took it up in the 1950s, acknowledged Szilard's paper as his starting point. Throughout his time in Berlin, Szilard worked on numerous technical inventions. In 1928 he submitted a patent application for the linear accelerator, not knowing of Gustav Ising's prior 1924 journal article and Rolf Widerøe's operational device, and in 1929 applied for one for the cyclotron. He also conceived the electron microscope. Between 1926 and 1930, he worked with Einstein to develop the Einstein refrigerator, notable because it had no moving parts. He did not build all of these devices, or publish these ideas in scientific journals, and so credit for them often went to others. As a result, Szilard never received the Nobel Prize, but Ernest Lawrence was awarded it for the cyclotron in 1939 and Ernst Ruska for the electron microscope in 1986. Szilard received German citizenship in 1930, but was already uneasy about the political situation in Europe. When Adolf Hitler became chancellor of Germany on January 30, 1933, Szilard urged his family and friends to flee Europe while they still could. He moved to England, and transferred his savings of £1,595 (£111,200 today) from his bank in Zurich to one in London. He lived in hotels where lodging and meals cost about £5/5 a week. For those less fortunate, he helped found the Academic Assistance Council, an organization dedicated to helping refugee scholars find new jobs, and persuaded the Royal Society to provide accommodation for it at Burlington House. He enlisted the help of academics such as Harald Bohr, G. H. Hardy, Archibald Hill and Frederick G. Donnan. By the outbreak of World War II in 1939, it had helped to find places for over 2,500 refugee scholars. In early 1934, Szilard began working at St Bartholomew's Hospital in London. Working with a young physicist on the hospital staff, Thomas A. Chalmers, he began studying radioactive isotopes for medical purposes. It was known that bombarding elements with neutrons could produce either heavier isotopes of an element, or a heavier element, a phenomenon known as the Fermi Effect after its discoverer, the Italian physicist Enrico Fermi. When they bombarded ethyl iodide with neutrons produced by a radon–beryllium source, they found that the heavier radioactive isotopes of iodine separated from the compound. Thus, they had discovered a means of isotope separation. This method became known as the Szilard–Chalmers effect, and was widely used in the preparation of medical isotopes. He also attempted unsuccessfully to create a nuclear chain reaction using beryllium by bombarding it with X-rays. In 1936, Szilard assigned his chain-reaction patent to the British Admiralty to ensure its secrecy. Szilard visited Béla and Rose and her husband Roland (Lorand) Detre, in Switzerland in September 1937. After a rainstorm, he and his siblings spent an afternoon in an unsuccessful attempt to build a prototype collapsible umbrella. One reason for the visit was that he had decided to emigrate to the United States, as he believed that another war in Europe was inevitable and imminent. He reached New York on the liner RMS Franconia on January 2, 1938. Over the next few months he moved from place to place, conducting research with Maurice Goldhaber at the University of Illinois at Urbana–Champaign, and then the University of Chicago, University of Michigan and the University of Rochester, where he undertook experiments with indium but again failed to initiate a chain reaction. In November 1938, Szilard moved to New York City, taking a room at the King's Crown Hotel near Columbia University. He encountered John R. Dunning, who invited him to speak about his research at an afternoon seminar in January 1939. That month, Niels Bohr brought news to New York of the discovery of nuclear fission in Germany by Otto Hahn and Fritz Strassmann, and its theoretical explanation by Lise Meitner, and Otto Frisch. When Szilard found out about it on a visit to Wigner at Princeton University, he immediately realized that uranium might be the element capable of sustaining a chain reaction. Unable to convince Fermi that this was the case, Szilard set out on his own. He obtained permission from the head of the Physics Department at Columbia, George B. Pegram, to use a laboratory for three months. To fund his experiment, he borrowed $2,000 from a fellow inventor, Benjamin Liebowitz. He wired Frederick Lindemann at Oxford and asked him to send a beryllium cylinder. He convinced Walter Zinn to become his collaborator, and hired Semyon Krewer to investigate processes for manufacturing pure uranium and graphite. Szilard and Zinn conducted a simple experiment on the seventh floor of Pupin Hall at Columbia, using a radium–beryllium source to bombard uranium with neutrons. Initially nothing registered on the oscilloscope, but then Zinn realized that it was not plugged in. On doing so, they discovered significant neutron multiplication in natural uranium, proving that a chain reaction might be possible. Szilard later described the event: "We turned the switch and saw the flashes. We watched them for a little while and then we switched everything off and went home." He understood the implications and consequences of this discovery, though. "That night, there was very little doubt in my mind that the world was headed for grief". While they had demonstrated that the fission of uranium produced more neutrons than it consumed, this was still not a chain reaction. Szilard persuaded Fermi and Herbert L. Anderson to try a larger experiment using 500 pounds (230 kg) of uranium. To maximize the chance of fission, they needed a neutron moderator to slow the neutrons down. Hydrogen was a known moderator, so they used water. The results were disappointing. It became apparent that hydrogen slowed neutrons down, but also absorbed them, leaving fewer for the chain reaction. Szilard then suggested Fermi use carbon, in the form of graphite. He felt he would need about 50 tonnes (49 long tons; 55 short tons) of graphite and 5 tonnes (4.9 long tons; 5.5 short tons) of uranium. As a back-up plan, Szilard also considered where he might find a few tons of heavy water; deuterium would not absorb neutrons like ordinary hydrogen, but would have the similar value as a moderator. Such quantities of materiel would require a lot of money. Szilard drafted a confidential letter to the President, Franklin D. Roosevelt, explaining the possibility of nuclear weapons, warning of the German nuclear weapon project, and encouraging the development of a program that could result in their creation. With the help of Wigner and Edward Teller, he approached his old friend and collaborator Einstein in August 1939, and convinced him to sign the letter, lending his fame to the proposal. The Einstein–Szilárd letter resulted in the establishment of research into nuclear fission by the U.S. government, and ultimately to the creation of the Manhattan Project. Roosevelt gave the letter to his aide, Brigadier General Edwin M. "Pa" Watson with the instruction: "Pa, this requires action!" An Advisory Committee on Uranium was formed under Lyman J. Briggs, a scientist and the director of the National Bureau of Standards. Its first meeting on October 21, 1939, was attended by Szilard, Teller, and Wigner, who persuaded the Army and Navy to provide $6,000 for Szilard to purchase supplies for experiments—in particular, more graphite. A 1940 Army intelligence report on Fermi and Szilard, prepared when the United States had not yet entered World War II, expressed reservations about both. While it contained some errors of fact about Szilard, it correctly noted his dire prediction that Germany would win the war. Fermi and Szilard met with representatives of National Carbon Company, who manufactured graphite, and Szilard made another important discovery. He asked about impurities in graphite, and learned that it usually contained boron, a neutron absorber. He then had special boron-free graphite produced. Had he not done so, they might have concluded, as the German nuclear researchers did, that graphite was unsuitable for use as a neutron moderator. Like the German researchers, Fermi and Szilard still believed that enormous quantities of uranium would be required for an atomic bomb, and therefore concentrated on producing a controlled chain reaction. Fermi determined that a fissioning uranium atom produced 1.73 neutrons on average. It was enough, but a careful design was called for to minimize losses. Szilard worked up various designs for a nuclear reactor. "If the uranium project could have been run on ideas alone," Wigner later remarked, "no one but Leo Szilard would have been needed." The Metallurgical Laboratory scientists, with Szilard third from right, in the lab coat. The December 6, 1941, meeting of the National Defense Research Committee resolved to proceed with an all-out effort to produce atomic bombs, a decision given urgency by the Japanese attack on Pearl Harbor the following day that brought the United States into World War II, and then formal approval by Roosevelt in January 1942. Arthur H. Compton from the University of Chicago was appointed head of research and development. 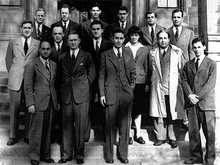 Against Szilard's wishes, Compton concentrated all the groups working on reactors and plutonium at the Metallurgical Laboratory of the University of Chicago. Compton laid out an ambitious plan to achieve a chain reaction by January 1943, start manufacturing plutonium in nuclear reactors by January 1944, and produce an atomic bomb by January 1945. In January 1942, Szilard joined the Metallurgical Laboratory in Chicago as a research associate, and later the chief physicist. Alvin Weinberg noted that Szilard served as the project "gadfly", asking all the embarrassing questions. Szilard provided important insights. While uranium-238 did not fission readily with slow, moderated neutrons, it might still fission with the fast neutrons produced by fission. This effect was small but crucial. Szilard made suggestions that improved the uranium canning process, and worked with David Gurinsky and Ed Creutz on a method for recovering uranium from its salts. A vexing question at the time was how a production reactor should be cooled. Taking a conservative view that every possible neutron must be preserved, the majority opinion initially favored cooling with helium, which would absorb very few neutrons. Szilard argued that if this was a concern, then liquid bismuth would be a better choice. He supervised experiments with it, but the practical difficulties turned out to be too great. In the end, Wigner's plan to use ordinary water as a coolant won out. When the coolant issue became too heated, Compton and the director of the Manhattan Project, Brigadier General Leslie R. Groves, Jr., moved to dismiss Szilard, who was still a German citizen, but the Secretary of War, Henry L. Stimson, refused to do so. Szilard was therefore present on December 2, 1942, when the first man-made self-sustaining nuclear chain reaction was achieved in the first nuclear reactor under viewing stands of Stagg Field, and shook Fermi's hand. Szilard became a naturalized citizen of the United States in March 1943. The Army offered Szilard $25,000 for his inventions before November 1940, when he officially joined the project. He refused. He was the co-holder, with Fermi, of the patent on the nuclear reactor. In the end he sold his patent to the government for reimbursement of his expenses, some $15,416, plus the standard $1 fee. He continued to work with Fermi and Wigner on nuclear reactor design, and is credited with coining the term "breeder reactor". With an enduring passion for the preservation of human life and political freedom, Szilard hoped that the U.S. government would not use nuclear weapons, but that the mere threat of such weapons would force Germany and Japan to surrender. He also worried about the long-term implications of nuclear weapons, predicting that their use by the United States would start a nuclear arms race with Russia. He drafted the Szilard petition advocating demonstration of the atomic bomb. The Interim Committee instead chose to use atomic bombs against cities over the protests of Szilard and other scientists. Afterwards, he lobbied for amendments to the Atomic Energy Act of 1946 that placed nuclear energy under civilian control. Szilard and Norman Hilberry at the site of CP-1, at the University of Chicago, some years after the war. It was demolished in 1957. In 1946, Szilard secured a research professorship at the University of Chicago that allowed him to research in biology and the social sciences. He teamed up with Aaron Novick, a chemist who had worked at the Metallurgical Laboratory during the war. The two men saw biology as a field that had not been explored as much as physics, and was ready for scientific breakthroughs. It was a field that Szilard had been working on in 1933 before he had become subsumed in the quest for a nuclear chain reaction. The duo made considerable advances. They invented the chemostat, a device for regulating the growth rate of the microorganisms in a bioreactor, and developed methods for measuring the growth rate of bacteria. They discovered feedback inhibition, an important factor in processes such as growth and metabolism. Szilard gave essential advice to Theodore Puck and Philip I. Marcus for their first cloning of a human cell in 1955. Before relation with his later wife Gertrud Weiss, Leo Szilard's life partner in the period 1927 – 1934 was kindergarten teacher and opera singer Gerda Philipsborn, who also worked as a volunteer in a Berlin asylum organization for refugee children and in 1932 moved to India to continue in this work. Szilard married Gertrud (Trude) Weiss, a physician, in a civil ceremony in New York on October 13, 1951. They had known each other since 1929, and had frequently corresponded and visited each other ever since. Weiss took up a teaching position at the University of Colorado in April 1950, and Szilard began staying with her in Denver for weeks at a time when they had never been together for more than a few days before. Single people living together was frowned upon in the conservative United States at the time, and after they were discovered by one of her students, Szilard began to worry that she might lose her job. Their relationship remained a long-distance one, and they kept news of their marriage quiet. Many of his friends were shocked when they found out, as it was widely believed that Szilard was a born bachelor. In 1949 Szilard wrote a short story titled "My Trial as a War Criminal" in which he imagined himself on trial for crimes against humanity after the United States lost a war with the Soviet Union. He publicly sounded the alarm against the possible development of salted thermonuclear bombs, explaining in radio talk on February 26, 1950, that sufficiently big thermonuclear bomb rigged with specific but common materials, might annihilate mankind. While Time magazine compared him to Chicken Little, and the Atomic Energy Commission dismissed the idea, scientists debated whether it was feasible or not. The Bulletin of the Atomic Scientists commissioned a study by James R. Arnold that concluded that it was. Szilard published a book of short stories, The Voice of the Dolphins (1961), in which he dealt with the moral and ethical issues raised by the Cold War and his own role in the development of atomic weapons. The title story described an international biology research laboratory in Central Europe. This became reality after a meeting in 1962 with Victor F. Weisskopf, James Watson and John Kendrew. When the European Molecular Biology Laboratory was established, the library was named The Szilard Library and the library stamp features dolphins. Other honors that he received included the Atoms for Peace Award in 1959, and the Humanist of the Year in 1960. A lunar crater on the far side of the Moon was named after him in 1970. The Leo Szilard Lectureship Award, established in 1974, is given in his honor by the American Physical Society. In 1960, Szilard was diagnosed with bladder cancer. He underwent cobalt therapy at New York's Memorial Sloan-Kettering Hospital using a cobalt 60 treatment regimen that he designed himself. A second round of treatment with an increased dose followed in 1962. The doctors tried to tell him that the increased radiation dose would kill him, but he said it wouldn't, and that anyway he would die without it. The higher dose did its job and his cancer never returned. This treatment became standard for many cancers and is still used. Szilard spent his last years as a fellow of the Salk Institute for Biological Studies in La Jolla, California, which he had helped to create. He was appointed a non-resident fellow there in July 1963, and became a resident fellow on April 1, 1964, after moving to La Jolla in February. With Trude, he lived in a bungalow on the property of the Hotel del Charro. On May 30, 1964, he died there in his sleep of a heart attack; when Trude awoke, she was unable to revive him. His remains were cremated. His papers are in the library at the University of California in San Diego. In February 2014, the library announced that they received funding from the National Historical Publications and Records Commission to digitize its collection of his papers, extending from 1938 to 1998. ^ "Founding". Council for a Livable World. Council for a Livable World. ^ Lanouette & Silard 1992, pp. 10–13. ^ Lanouette & Silard 1992, pp. 13–15. ^ Lanouette & Silard 1992, p. 167. ^ Byers, Nina. "Fermi and Szilard". Retrieved May 23, 2015. ^ Frank 2008, pp. 244–246. ^ Blumesberger, Doppelhofer & Mauthe 2002, p. 1355. ^ Lanouette & Silard 1992, pp. 36–41. ^ Bess 1993, p. 44. ^ Lanouette & Silard 1992, p. 42. ^ Lanouette & Silard 1992, pp. 44–46. ^ Lanouette & Silard 1992, pp. 44–49. ^ Lanouette & Silard 1992, pp. 49–52. ^ Lanouette & Silard 1992, pp. 56–58. ^ Hargittai 2006, p. 44. ^ Szilard, Leo (December 1, 1925). "Über die Ausdehnung der phänomenologischen Thermodynamik auf die Schwankungserscheinungen". Zeitschrift für Physik (in German). 32 (1): 753–788. Bibcode:1925ZPhy...32..753S. doi:10.1007/BF01331713. ISSN 0044-3328. ^ Lanouette & Silard 1992, pp. 60–61. ^ Szilard, Leo (1929). "Über die Entropieverminderung in einem thermodynamischen System bei Eingriffen intelligenter Wesen". Zeitschrift für Physik (in German). 53 (11–12): 840–856. Bibcode:1929ZPhy...53..840S. doi:10.1007/BF01341281. ISSN 0044-3328. Available on-line in English at Aurellen.org. ^ a b Lanouette & Silard 1992, pp. 62–65. ^ Telegdi, V. L. (2000). "Szilard as Inventor: Accelerators and More". Physics Today. 53 (10): 25–28. Bibcode:2000PhT....53j..25T. doi:10.1063/1.1325189. ^ Calaprice & Lipscombe 2005, p. 110. ^ Lanouette & Silard 1992, pp. 101–102. ^ Lanouette & Silard 1992, pp. 83–85. ^ Dannen, Gene (9 February 1998). "Leo Szilard the Inventor: A Slideshow". Retrieved May 24, 2015. ^ Fraser 2012, p. 71. ^ Rhodes 1986, p. 26. ^ Lanouette & Silard 1992, pp. 119–122. ^ Lanouette & Silard 1992, pp. 131–132. ^ Rhodes 1986, p. 27. ^ "Szilard's patent specification". September 28, 1949. ^ Lanouette & Silard 1992, pp. 133–135. ^ Rhodes 1986, pp. 292–293. ^ Szilard, L.; Chalmers, T. A. (September 22, 1934). "Chemical Separation of the Radioactive Element from its Bombarded Isotope in the Fermi Effect". Nature. 134 (3386): 462. Bibcode:1934Natur.134..462S. doi:10.1038/134462b0. ISSN 0028-0836. ^ Szilard, L.; Chalmers, T. A. (September 29, 1934). "Detection of Neutrons Liberated from Beryllium by Gamma Rays: a New Technique for Inducing Radioactivity". Nature. 134 (3387): 494–495. Bibcode:1934Natur.134..494S. doi:10.1038/134494b0. ISSN 0028-0836. ^ Lanouette & Silard 1992, pp. 145–148. ^ Lanouette & Silard 1992, p. 148. ^ Brasch, A.; Lange, F.; Waly, A.; Banks, T. E.; Chalmers, T. A.; Szilard, Leo; Hopwood, F. L. (December 8, 1934). "Liberation of Neutrons from Beryllium by X-Rays: Radioactivity Induced by Means of Electron Tubes". Nature. 134 (3397): 880. Bibcode:1934Natur.134..880B. doi:10.1038/134880a0. ISSN 0028-0836. ^ Rhodes 1986, pp. 224–225. ^ Lanouette & Silard 1992, pp. 166–167. ^ a b Lanouette & Silard 1992, pp. 172–173. ^ Lanouette & Silard 1992, pp. 178–179. ^ Lanouette & Silard 1992, pp. 182–183. ^ Lanouette & Silard 1992, pp. 186–187. ^ Rhodes 1986, p. 291. ^ Rhodes 1986, p. 292. ^ Lanouette & Silard 1992, pp. 194–195. ^ The Atomic Heritage Foundation. "Einstein's Letter to Franklin D. Roosevelt". Retrieved May 26, 2007. ^ The Atomic Heritage Foundation. "Pa, this requires action!". Archived from the original on October 29, 2012. Retrieved May 26, 2007. ^ Hewlett & Anderson 1962, pp. 19–21. ^ Lanouette & Silard 1992, pp. 223–224. ^ Lanouette & Silard 1992, p. 222. ^ Bethe, Hans A. (March 27, 2000). "The German Uranium Project". Physics Today. 53 (7): 34. Bibcode:2000PhT....53g..34B. doi:10.1063/1.1292473. ^ a b Lanouette & Silard 1992, p. 227. ^ Hewlett & Anderson 1962, p. 28. ^ a b Lanouette & Silard 1992, pp. 227–231. ^ a b Weinberg 1994, pp. 22–23. ^ Weinberg 1994, p. 17. ^ Weinberg 1994, p. 36. ^ Lanouette & Silard 1992, pp. 234–235. ^ Lanouette & Silard 1992, pp. 238–242. ^ Lanouette & Silard 1992, pp. 243–245. ^ Lanouette & Silard 1992, p. 249. ^ Lanouette & Silard 1992, p. 253. ^ Lanouette & Silard 1992, p. 254. ^ Weinberg 1994, pp. 38–40. ^ Lanouette & Silard 1992, pp. 266–275. ^ a b Lanouette & Silard 1992, pp. 377–378. ^ Grivet, Jean-Philippe (January 1, 2001). "Nonlinear population dynamics in the chemostat" (PDF). Computing in Science and Engineering. 3 (1): 48–55. doi:10.1109/5992.895187. ISSN 1521-9615. The chemostat was independently invented the same year by Jacques Monod. ^ Novick, Aaron; Szilard, Leo (December 15, 1950). "Description of the Chemostat". Science. 112 (2920): 715–716. Bibcode:1950Sci...112..715N. doi:10.1126/science.112.2920.715. ISSN 0036-8075. PMID 14787503. ^ Hargittai 2006, pp. 143–144. ^ Lanouette & Silard 1992, pp. 395–397. ^ Dannen, Gene (26 January 2015). "Physicist's Lost Love: Leo Szilard and Gerda Philipsborn". dannen.com. Retrieved January 24, 2016. ^ Esterer & Esterer 1972, p. 148. ^ Lanouette & Silard 1992, pp. 334–339. ^ Jogalekar, Ashutosh (February 18, 2014). "Why the world needs more Leo Szilards". Scientific American. Retrieved May 29, 2015. ^ Lanouette & Silard 1992, pp. 317, 366. ^ "Brief History". European Molecular Biology Laboratory. Archived from the original on April 13, 2014. Retrieved February 22, 2011. ^ "Szilard Library". European Molecular Biology Laboratory. Retrieved February 22, 2011. ^ "The Humanist of the Year". American Humanist Association. Archived from the original on January 14, 2013. Retrieved May 29, 2015. ^ "Szilard". United States Geographical Survey. Retrieved May 29, 2015. ^ "Leo Szilard Lectureship Award". American Physical Society. Retrieved 25 March 2016. ^ Tech, Motley. "The man who changed war, peace and the world". Archived from the original on December 3, 2015. Retrieved May 1, 2015. ^ Lanouette & Silard 1992, pp. 400–401. ^ a b "Leo Szilard Papers, 1898 – 1998 MSS 0032". University of California in San Diego. Retrieved May 29, 2015. ^ Lanouette & Silard 1992, p. 477. ^ Lanouette & Silard 1992, p. 479. ^ Davies, Dolores. "Materials Documenting Birth of Nuclear Age to be Digitized". Retrieved May 29, 2015. Bess, Michael (1993). Realism, Utopia, and the Mushroom Cloud: Four Activist Intellectuals and their Strategies for Peace, 1945–1989. Chicago: University of Chicago Press. ISBN 0-226-04421-1. OCLC 27894840. Blumesberger, Susanne; Doppelhofer, Michael; Mauthe, Gabriele (2002). Handbuch österreichischer Autorinnen und Autoren jüdischer Herkunft. 1. Munich: K. G. Saur. ISBN 9783598115455. OCLC 49635343. Calaprice, Alice; Lipscombe, Trevor (2005). Albert Einstein: A Biography. Westport, Connecticut: Greenwood Press. ISBN 978-0-313-33080-3. OCLC 57208188. Esterer, Arnulf K.; Esterer, Luise A. (1972). 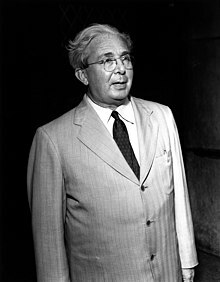 Prophet of the Atomic Age: Leo Szilard. New York: Julian Messner. ISBN 0-671-32523-X. OCLC 1488166. Frank, Tibor (2008). Double exile: migrations of Jewish-Hungarian professionals through Germany to the United States, 1919–1945. Exile Studies. 7. Oxford: Peter Lang. ISBN 3-03911-331-3. OCLC 299281775. Fraser, Gordon (2012). The Quantum Exodus. Oxford: Oxford University Press. ISBN 978-0-19-959215-9. OCLC 757930837. Szilard, Leo; Weiss-Szilard, Gertrud; Weart, Spencer R. (1978). Leo Szilard: His Version of the Facts – Selected Recollections and Correspondence. Cambridge, Massachusetts: The MIT Press. ISBN 0-262-69070-5. OCLC 4037084. Szilard, Leo (1992). The Voice of the Dolphins: And Other Stories (Expanded edition from 1961 original ed.). Stanford, California: Stanford University Press. ISBN 0-8047-1754-0. OCLC 758259818. Wikimedia Commons has media related to Leó Szilárd. Register of the Leo Szilard Papers, MSS 32, Special Collections & Archives, UC San Diego Library. Leo Szilard Papers, MSS 32, Special Collections & Archives, UC San Diego Library. Lanouette/Szilard Papers, MSS 659, Special Collections & Archives, UC San Diego Library.